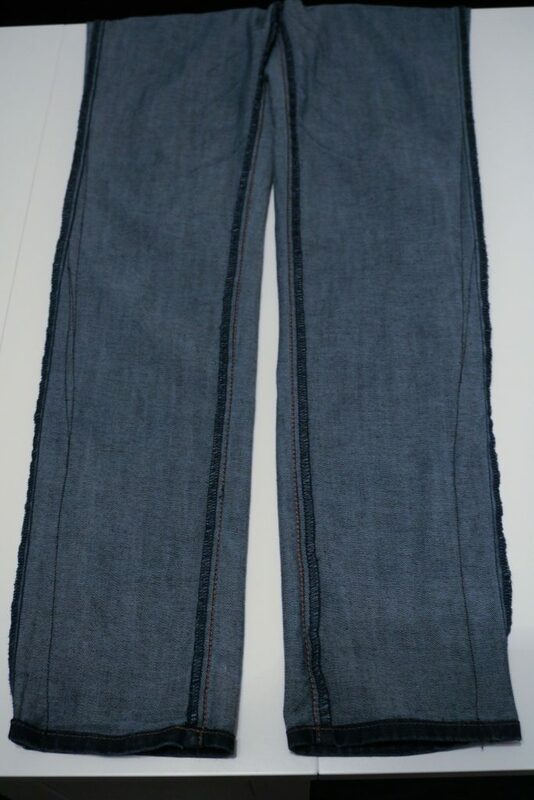 I ordered a pair of second-hand jeans from ThredUP for $11.99 and although the waist fit perfectly, they were 4″ too long and much too loose around the knees/calf to look good with a tunic. After an hour with a sewing machine and scissors, they fit perfectly! 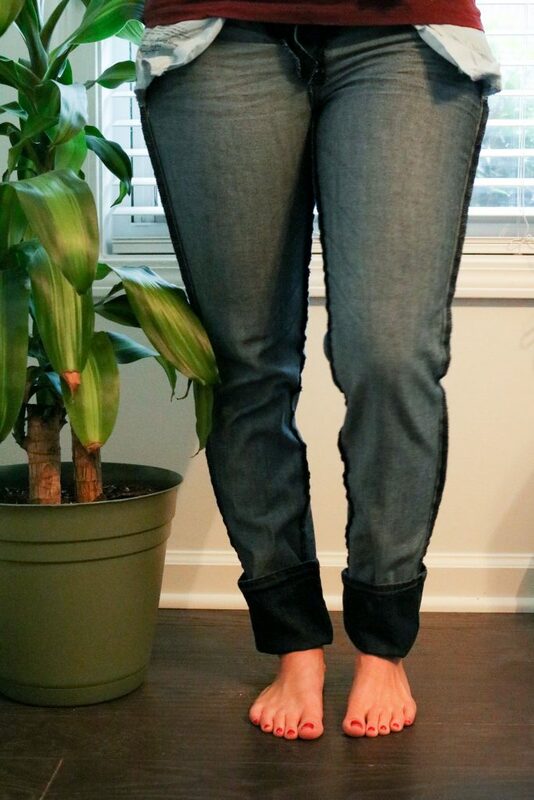 I thought I’d share how I tailored my skinny jeans so you can do it too! A quick note about buying jeans online: A friend introduced me to American Eagle Artist-fit jeans 6 years ago and they’ve been my favorite fit ever since. They are not “skinny” style though, so I’ve started testing other fits of AE jeans. I buy them all second-hand from ThredUP and can tell which ones are Artist fit from the pictures because that style has a double-button waistband. 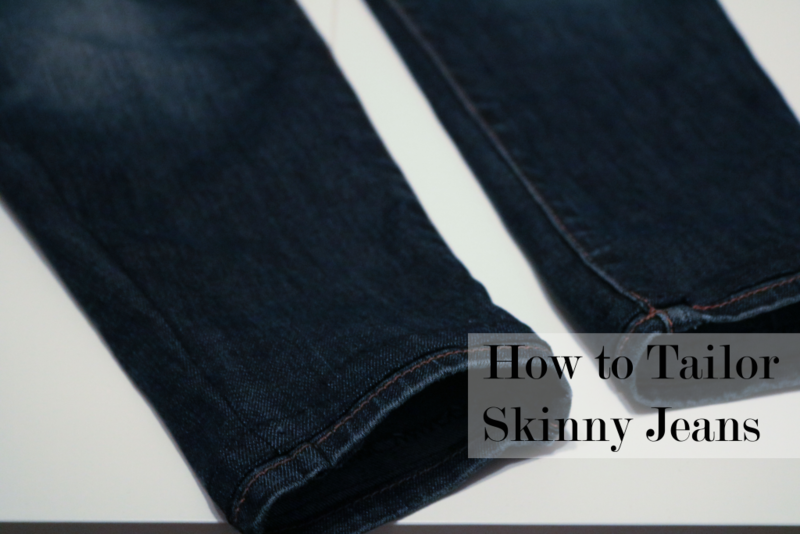 The jeans I’m altering in this post are the “Skinny-fit Jegging” style. The Artist fit has been with me through thick and thin, literally. I started out in a 6, went down to a 2 the summer I was super sick, and now I’m up to an 8. If you’re a strong hourglass figure and searching for a tried-and-true jean, try on some American Eagle Artists! Step 1: Put pants on inside out. 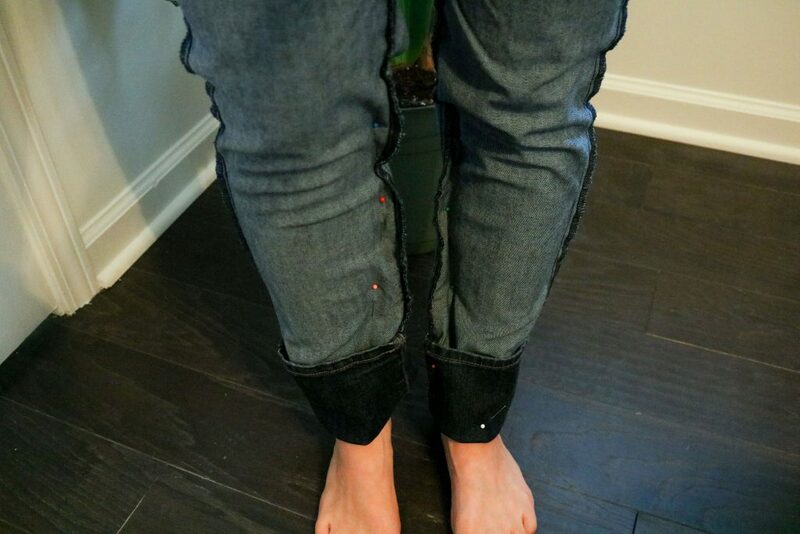 Step 2: Pull the jeans tight against your calves to the fit you’d like and pin parallel to the seam you’ll be altering. This picture the pins are on the wrong seam; should have been on the outer leg. Here’s how to determine which seam to alter: The one that isn’t top-stitched. On jeans that’s pretty easy to spot because it is typically stitched with a contrasting thread. 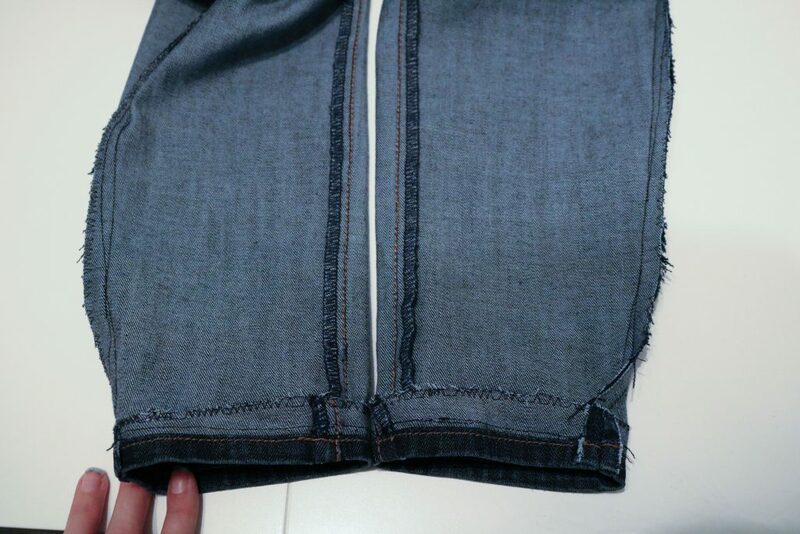 On my jeans, the inner seam was top-stitched so I altered the outer leg seam. The reason we do the non-topstitched seam is because we would have to re-do the stitching after altering and that’s a whole lot of hassle. 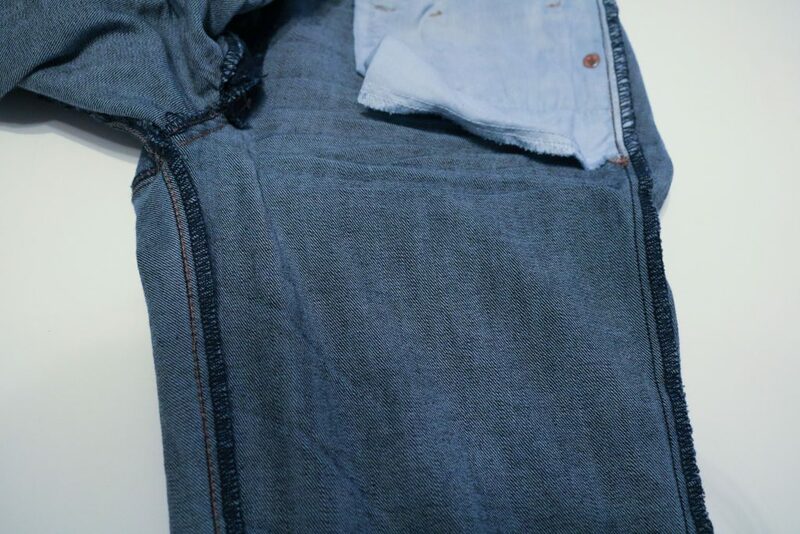 Step 3: Using a thread that matches the fabric of your jeans (I used black on a darkwash jean. Dark blue would have worked too.) start stitching in the current leg seam and gradually veer to fully “take in” the excess fabric, finishing up with a backstitch at the hem. 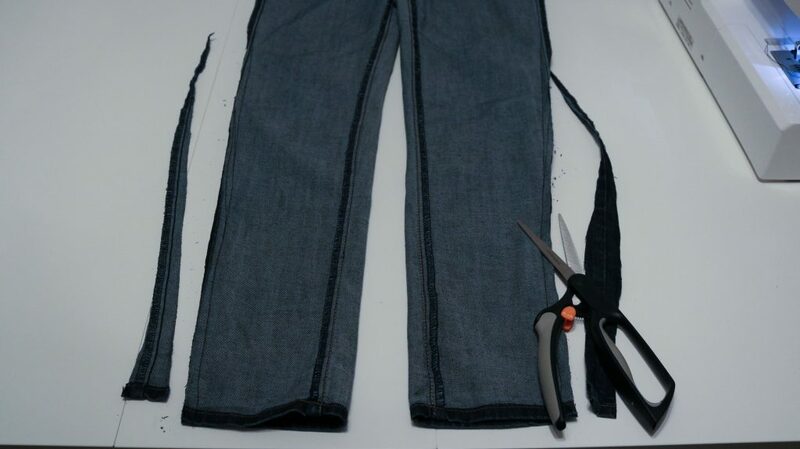 Step 4: Try your jeans on and continue to smooth out the altering seam by merging and veering with/from the side seams. Be sure to turn them right side out to check the fit! 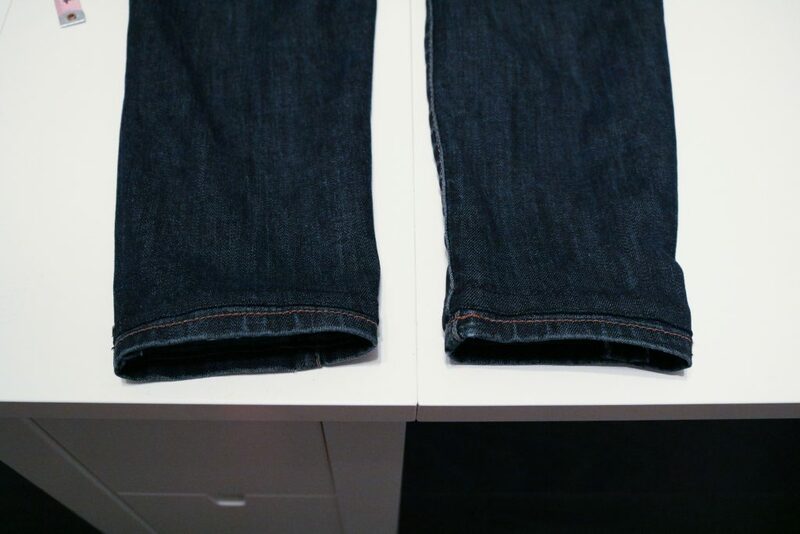 It always takes me several tries to get the fitting right because each pair of jeans is different. Step 5: Trim off the extra fabric and finish the seam by zig-zaging over the edge. 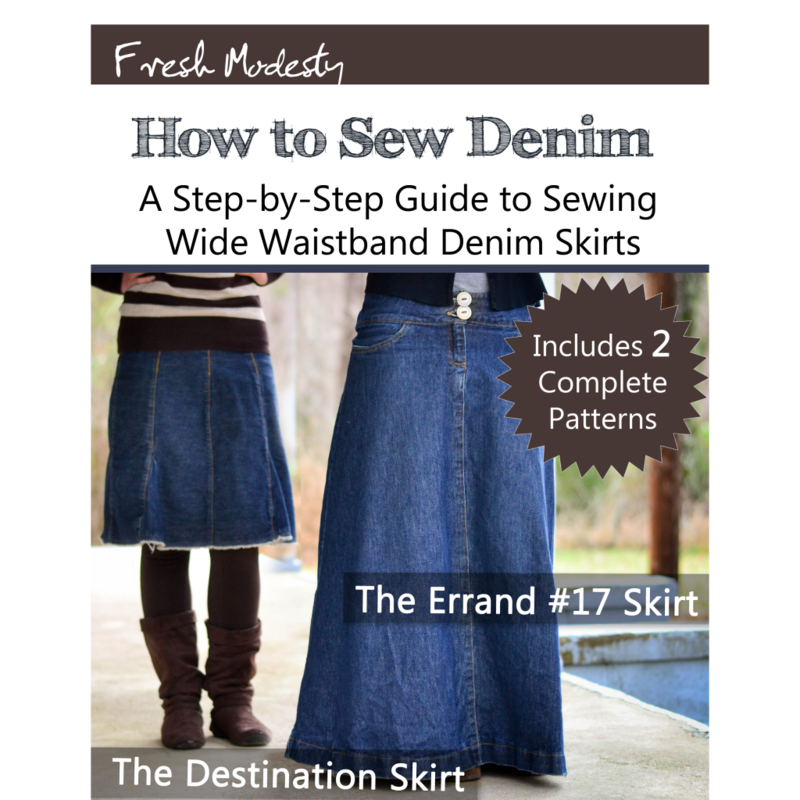 Step 6: Hem jeans, keeping the original hem. I followed this tutorial on Craftsy! Not super pretty inside because I was tired and rushing, but you can’t tell from the outside! Step 7: Wear with confidence! Now as I wear my tunics I don’t feel sloppy because my jeans actually fit! 😀 I hope this was helpful! Please let me know if you have any questions! I love tunics with my jeans, but can never find youthful looking ones. Do you get all of yours at ThredUP, or is there a store you like for stylish tops? Can the same method be used to take in the thighs? That’s where my jeans are really baggy! Now to get my machine going again! This is an awesome post! Almost never do off-the-rack jeans fit. So it’s nice to have an easy way to correct this. Just curious… how do you “create” your outfits and decide what looks good together? I see girls creating cute outfits with colors that vary, but also compliment each other. Whoever I put together something like that I feel like it’s wild and I can never convince myself to go out in public in it. Do you have list or anything that you use to help you create the cute and flattering outfits you’re always wearing? Thanks for any info! i love your idea i just started sewing can i still make this? I will definitely use this again! Do you think that you could make a video for this? 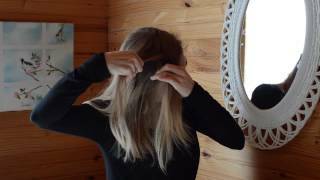 Love this tutorial & jean-finding tips! 🙂 Also, I would love to see some of your tunic/skinny jean outfits. 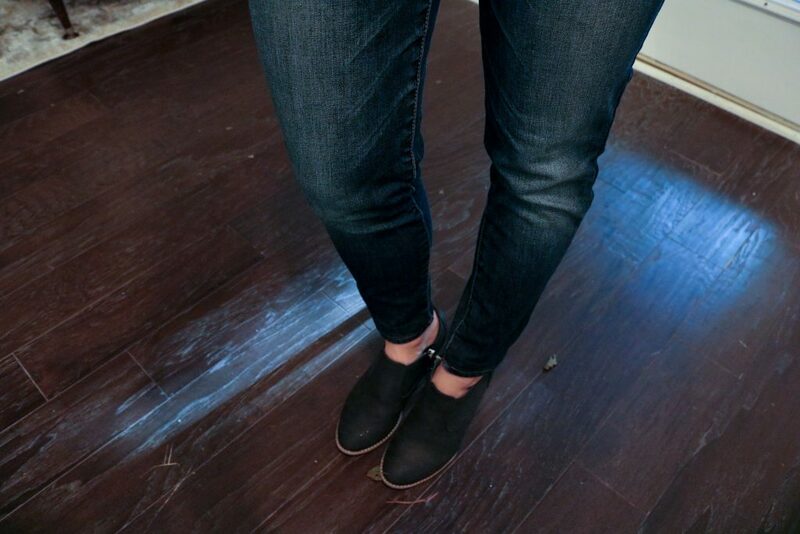 I love my jeans, but trying to wear them modestly & still look classy/fashionable is so difficult! Good morning Olivia, I enjoy you your tutorial and hope your health is improving. God bless you and Calvin.